Safe and responsible development of oil and gas from shale provides America with effective access to significant new supplies of these essential energy resources that fuel our daily lives, provide jobs and contribute to the U.S. economy as a whole. Many people are familiar with traditional, or conventional, oil and gas drilling. The geology of these conventional reservoirs has porosity and permeability that allows oil and gas to flow through the rock matrix, where they can be extracted with more traditional drilling techniques. With shale formations, the pore spaces are significantly smaller, tighter and much more restrictive than conventional fields. Unlike conventional formations, shale acts as both the source and the reservoir for the oil and gas. These reservoirs are deep, as much as a mile or more, below the surface. 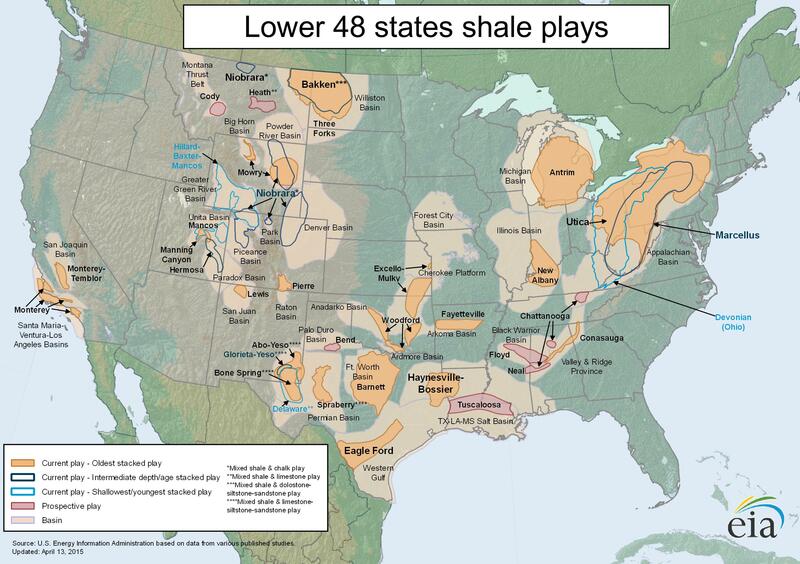 Below is a map of some of some of the most important shale plays in the country. Today, the Eagle Ford in South Texas and the Bakken in North Dakota and Montana are the two largest producers of unconventional oil, although there are many other regions with active drilling. While the Bakken currently produces more oil than the Eagle Ford, the Eagle Ford is growing rapidly and some experts predict that it could become the leading U.S. oil-focused shale play over the next few years.